The first of the several million photographs that have been made of Old Faithful geyser were made by William Henry Jackson in 1871. Jackson's plates required a much longer exposure than would have been ideal, and in consequence the spout came out looking a little woolly. Nevertheless his pictures were very fine, and if the problem had been simply that of making a generalized document of the great periodical monument the subject could have been considered disposed of one hundred years ago. Faithful or not, however, the geyser never really repeats an earlier performance; the spout of water itself and the light and the quality of the day are always different. The event is new again each time. 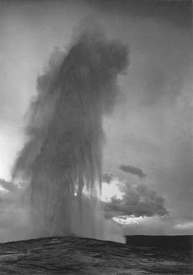 Ansel Adams photographed the geyser on at least three separate occasions during the early forties, and produced pictures that are profoundly different from each other. The difference is due not to a willful act of artistic interpretation, but rather to the precision of Adams's sensibility: He saw what was there not in vague and general terms, but with a rigorous exactitude. The problem (as Cezanne put it) was to realize his sensation. Much of the best photography of the past generation has concerned itself with giving permanent form to the ephemeral. This concern has expressed itself not only in the analysis of that swarming flux of movement within which Cartier-Bresson found his decisive moment, but also in the approach to subjects that the casual observer might think static. A landscape does not move in the conventional sense, but it changes constantly in other ways, most notably through the agency of light. 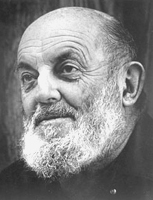 Ansel Adams attuned himself more precisely than any photographer before him to a visual understanding of the specific quality of the light that fell on a specific place at a specific moment. For Adams the natural landscape is not a fixed and solid sculpture but an insubstantial image, as transient as the light that continually redefines it. 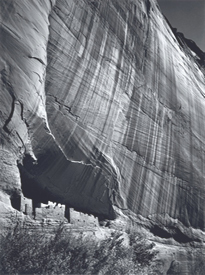 This sensibility to the specificity of light was the motive that forced Adams to develop his legendary photographic technique. This brilliant technique might be a millstone around the neck of a photographer who did not need it; for Adams nothing less would suffice to describe his subject. 400 PHOTOGRAPHS presents the full spectrum of Adams' work in a single volume for the first time, offering the largest available compilation from his legendary photographic career. 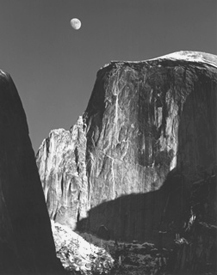 With more than two hundred photographs - many rarely seen and some never before published - this is the most comprehensive collection of Ansel Adams' photographs of America's national parks and wilderness areas. This is an atrractively priced photography classic made accessible to a wider, new audience. It covers everything from "seeing" the finished photo in advance, to lens choices. 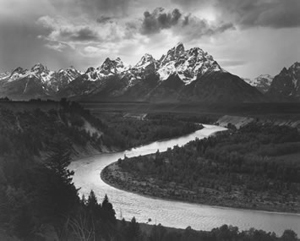 It is illustrated with many of Ansel Adams most famous images.